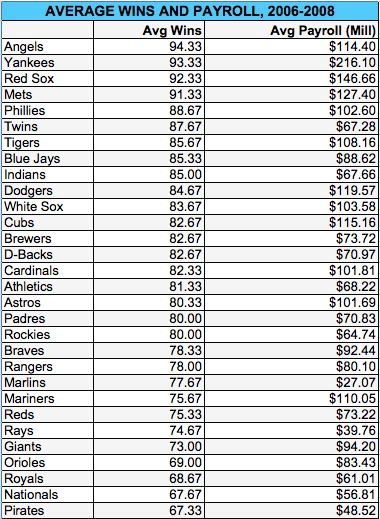 The Commissioner's Office released the final baseball payrolls for 2008 in late December. Not surprisingly, the New York Yankees spent $75 million more than the next highest team (Boston Red Sox) and $126 million over the average MLB team. Last year, in an effort to analyze payroll efficiency, I created a graph with payroll on the y-axis and wins on the x-axis. I added a positively sloping trendline and four quadrants to provide a visual aid in determining the most and least efficient teams in terms of payrolls and wins. Rob Neyer suggested that I plot this same information using multiple seasons, "as that would give us a better idea of the franchises' general competence over a period of years." With the foregoing in mind, I did just that. Thanks to data provided by Maury Brown at the Biz of Baseball, I added up the player payrolls and wins for the previous three seasons and divided them by three to get an average of each. The two tables below detail the average payrolls and win totals, sorted by the former on the left and the latter on the right. The average payroll works out to $89.86M, which means MLB has spent an average of approximately $2.7 billion in each of the past three years (for a grand total in excess of $8 billion). Payrolls cover the 40-man rosters and include salaries and prorated shares of signing bonuses, earned incentive bonuses, non-cash compensation, buyouts of unexercised options and cash transactions. In some cases, parts of salaries that are deferred are discounted to reflect present-day values. Luxury taxes are not part of these payroll figures nor are the posting fees for Japanese players. As shown, the Yankees led the majors in payroll over the 2006-2008 seasons, spending $70M more than the Red Sox and $126M over the average team. Nonetheless, the Los Angeles Angels have won more games than any other club during this same period, followed by the Yankees, Red Sox, and Mets. These four franchises were the only ones to average 90 or more victories the past three campaigns. Of note, the Bronx Bombers have spent $100M more per season than the Angels (and $305M over the three years), yet have one less win per campaign to show for their efforts. The inclusion of luxury taxes and posting fees would only widen the gap between the Yankees and the rest of the league. Based on this graph, we can once again categorize teams by the trendline and the four quadrants. Starting in the upper-right end of the graph and moving clockwise, the northeast quadrant includes teams that won more games than average with a higher-than-average payroll. The southeast quadrant depicts clubs that won more games than average with a lower-than-average payroll. The southwest quadrant includes teams that won fewer games than average with a below-average payroll. The northwest quadrant lists teams that won fewer games than average with a higher-than-average payroll. 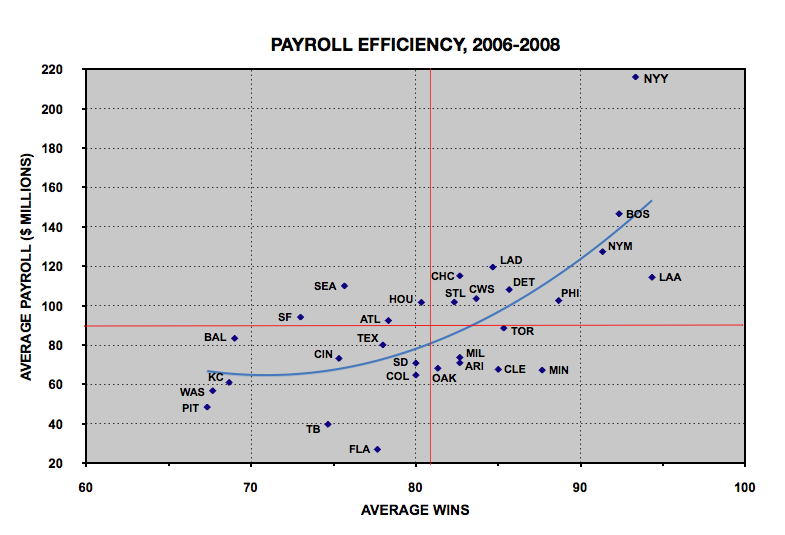 The blue trendline indicates the positive correlation of team payroll and wins. The correlation coefficient works out to 0.64. The coefficient of determination (or R-squared) is 0.41, which means payroll explains 41 percent of a team's win total. A large portion of the balance is determined by the impact of "cost-controlled" players (i.e., minimum or close to minimum in years one through three and roughly 40-60-80 percent of free agent market values in years four through six, respectively) as Dave Studeman, who improved the correlation coefficient to 0.77 and the R-squared to nearly 0.60 for the 2006 season, pointed out in an intelligent piece in The Hardball Times a couple of years ago. 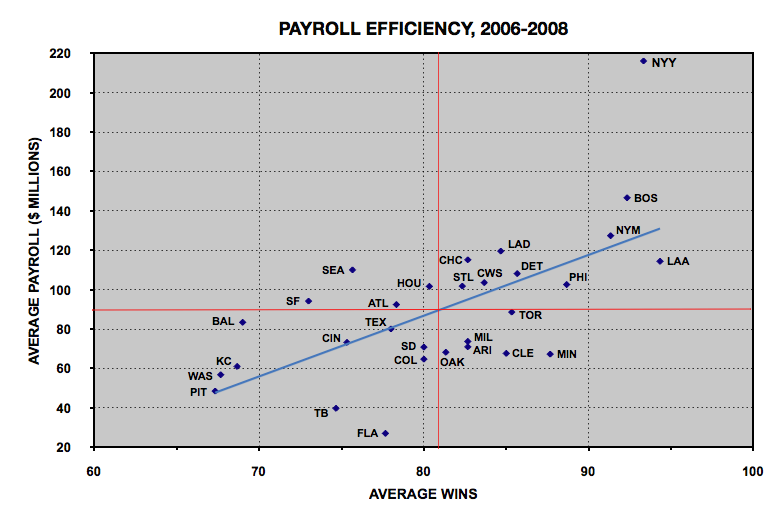 Furthermore, the relationship between payroll and wins is not linear. The difference between the highs and lows of wins (67-94) is much more tightly bunched than payrolls ($27M-$216M), suggesting that marginal wins are significantly more costly than average wins. In other words, going from 70 to 80 wins isn't as important — or costly — as going from 80 to 90 wins. By my count, 68 of the 78 teams that have won at least 90 games during the past 10 years have participated in the postseason. Win 90 and you have about an 87 percent chance of playing beyond the regular season. Sticking to the graph, teams above the line were less efficient and teams below the line were more efficient in terms of getting the most bang for their buck. While average wins are a reasonable proxy of success, most teams are primarily focused on earning a spot in the playoffs to give them a shot at winning the World Series. Under the "flags fly forever" truism, I'm going to excuse any team that wins it all from the list of so-called inefficient teams. While the Red Sox may pay up for (part of) their success, the truth of the matter is that Boston is the only team that has won two World Series titles during the current decade. In other words, the Red Sox have been more efficient in winning World Championships than any team in baseball, not an insignificant accomplishment for a franchise that calls the AL East its home. Aside from the Red Sox (and the Cardinals and Phillies, winners of the other two World Series in the past three seasons), which teams were the most and least efficient during the 2006-2008 time frame? I already cited the Phillies for winning the World Series last season but Philadelphia and the Los Angeles Angels deserve a lot of credit for payroll efficiency as well. The former captured the NL East in 2007 and 2008 and narrowly missed the playoffs in 2006, while the latter took the AL West the past two seasons but lost to the Red Sox in the ALDS both times. The Halos, lest we forget, are one of the eight clubs to have won a World Series title this decade. Colorado, San Diego, Florida, and Tampa Bay share the award for "doing the best while pinching pennies." The Rockies (2007) and Rays (2008) made it to the World Series, while the Padres were awarded the NL West title in 2006 due to winning the season series vs. the Dodgers, the other team that won 88 games that year, and lost in a play-in game the following season. The Marlins, of course, won the World Series in 2003, the second in just a seven-year span. The clubs in the northeast quadrant and above the trendline had mixed results. All of these teams won more than their share of games, but they did so at a cost. The Yankees are the biggest outliers by far, spending over $200M above and beyond the Red Sox with no World Series titles and only two postseason wins to show for their huge financial commitment. In fairness to the Yankees, they won a World Championship at the outset of the decade and missed out on the playoffs in 2008 for the first time since the strike-shortened season in 1994. All of the NEQ clubs made it to the playoffs at least once but only the Red Sox and Cardinals won championships. Moving to the least efficient teams, Seattle wins the award for "doing the least with the most," while San Francisco, Atlanta, and Houston also won less than their fair share of games while sporting higher than average payrolls. In addition, Baltimore, Kansas City, and Washington spent payroll dollars unwisely during the past three years. Pittsburgh, Cincinnati, and Texas all reside on top of the trendline, meaning each team won about as many games as expected given their payrolls. While relatively simplistic, graphing payrolls and wins — especially over a multi-year period — allows us to evaluate how efficiently ownerships and managements are spending payroll dollars. Update: The following graph is the same as the one above except that it includes a polynomial rather than linear trendline. The polynomial trendline improves the R-squared to .49 versus .41 for the linear. In response to a reader's question in the comments section below, I listed the regressions for each and calculated marginal wins are worth approximately $3M using the linear and range from essentially zero at the left end to as much as $7M at the right end (i.e. going from 92 to 93 wins) based on the polynomial. The bottom line is that the polynomial regression does a much better job at capturing marginal payroll and wins than the linear expression. "In other words, the Red Sox have been more efficient in winning World Championships than any team in baseball, not an insignificant accomplishment for a franchise that calls the AL East its home." Huh? 2 championships over 8 years (starting in 2001) at over $100mm a year -- that's well over $400mm per championship. Compared to Florida, who has 1 WS in that span and has consistently spent under $50mm (and coming from the no-slouch NL East), I'm not sure what the basis for this claim is. If the measure is $/WS, the Marlins are clearly more efficient than the Sox. Teams 'above the line were less efficient ' -- and if you're going to make a claim about the post-season, at least do some math to support it. We all know how well the binomial behaves in samples of size 5 and 7 so supposing that an efficient team during the season (which the graph indicates the Sox were not, anyway) will behave efficiently in the post-season doesn't follow. For more, see Oakland and Minnesota. Good article about the regular season, inaccurate post-season sidenote that is unrelated to the general line of reasoning. Interesting data, Rich. Thanks for compiling and presenting it. Can you tell us the slope of the regression line, i.e. how much are teams paying for each marginal win? Very nice look into this, Rich, and I think it has a lot of potential. However, I still think such an analysis is only in a fledgling stage. The biggest flaw I see in this is that it assumes an even playing field for all teams, that teams should be compared to the whole of Major League baseball. Considering that teams play the vast majority of their games within their own league, and that intra-league schedules are unbalanced based on division, this isn't a very fair assessment. For example, the Blue Jays place near the middle of average payroll, but can you really expect an even win return per million dollar spent by them to a team in, for example, the AL Central. I view that as a retorical question with the answer "no". I'd argue that almost every team in baseball has an innate advantage every year over the Blue Jays, so they need an handicap, a "ballpark adjustment" as it were. Perhaps this can be done by comparing team payrolls to the weighted average of the payrolls on their schedule. I'm not well-practiced in the area of statistics, so I'm not sure how this would be done, but I think this would offer a lot more in terms of comparing teams fairly. P.S. As a Red Sox fan, I have a selfish reason to pursue this. It's similar to how I feel it's unfair for teams to treat the Red Sox like the team with the second biggest "advantage" in baseball. In an attempt to create a quick and dirty "handicap" for the Sox, I tried this analysis: take the highest payroll team in eash division, and put those teams ahead of everyone else (because the playoff system is essentially division-based, your division is all that really matters). Then, take the remaining teams and determine what percentage of their own division-leaders payroll they spent; the smaller the percentage, the greater the payroll disadvantage that team has in making the playoffs. Not to my surprise, the Red Sox placed right in the middle of the pack in this regard (abot 14th or 15th), as they have a huge initial financial disadvantage when they try to win the division (and, of course, the other AL East teams had an even worse disadvantage...whatever handicap the Sox have, those other three undeniably have it worse). How many championships in total and games would the Yankees need to win (annually) in order to achieve "payroll efficiency"? It seems both numbers would have to be awfully high. Thanks for this Rich. I have been looking for something like this forever. Guy: The equation is y = 3.0844x - 159.9. As such, each marginal win is worth about $3 million. Plug in 81 wins and y = $89.9364M. Those two numbers are the league-wide averages. However, as we know, the real trade-off between payroll and wins is not linear. That said, the linear regression does a pretty good job at capturing marginal victories near the mean but not as well for those incremental wins at the ends of the spectrum. A polynomial trendline returns an R-squared of .4892 (vs. .41 for the linear trendline). Nonetheless, the following equation is a bit convoluted for my tastes: y = 0.1616x(squared) - 22.909x + 876.88. Plugging in several numbers suggests the marginal win is worth about $3.5M near the mean but increases to $6M for the incremental win between 89 and 90, which means it does a better job of matching reality than the linear relationship. Yankees would need to win roughly 122 games to achieve "payroll efficiency"... Ouch! Thanks for the equations, Rich. The polynomial is definitely an improvement, and the results make sense. I suppose this is a question of which way you want to look at it, but I was thinking of the Wins being the dependent variable (as though I were a team owner gauging how much to spend on my payroll). Choosing one variable or the other can make a big difference in the resulting regression (because different sets of errors are being minimized). In this case, for example, the R-squared value for a least-squares linear model of Wins, regressed on Payroll is 0.407, whereas the quadratic version yields an R-squared of 0.413. The biggest flaw in this analysis is it assumes payroll efficiency is defined solely by the number of wins a team has (or worse, the number of championships). By all accounts, the Yankees are a very successful business. They sell a lot of tickets and get the highest ratings of any RSN in the nation. The way there are able to sustain this model is by having a perennial playoff contender. Toward that end, the Yankees have spent significantly. Unless you can illustrate that the Yankees are not being run well as a business, you can’t state that the Yankees payroll is inefficient. Put another way…the Yankees need to make the playoffs each year to sustain the dominance and popularity of its brand. Winning 122 games is irrelevant if 95 wins is enough to make the playoffs. I guess the Yankees could try to make the playoffs each season at a lower payroll, but I think they have correctly reasoned that overspending on their main input (player) is worth mitigating the risk that the team will not make the playoffs. Basically, I don’t think you can look at payroll efficiency in short spans, nor can you ignore the business end. While some teams can look very efficient, if they don’t sustain their success, the long-term business gains are dissipated and the likelihood of sustained success is lessened. Rich, why not include the luxury tax? 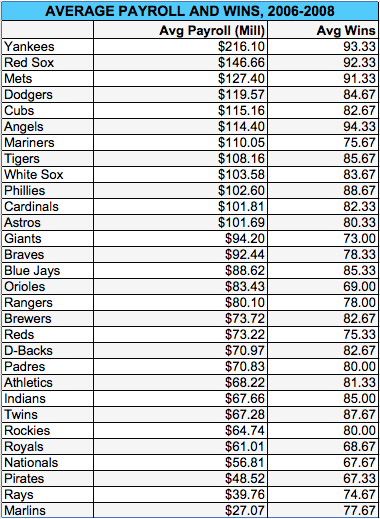 From the teams' perspective, these are just as real payroll dollars as those going to the players (and their agents). Isn't your research question concerning money spent by teams, not money earned by players? Good stuff, I've done a regression using just individual years a few times (different years) and it usually doesn't come up with much. Either the R^2 is small or the slope is small (ie. not significantly different from zero). I like the idea of using a 3 year average to take some of the the luck out of the equation that can go into a particular season's win total. My one suggestion is this: Drop the Yankees and see what happens. The Yankees play by an entirely different set of rules when it comes to their budget management. I know this kind of thing is usually frowned upon in statistical analysis, but I think in this case we have a good reason to do so. Even the other ~6 "rich" teams pail in comparison to the Yankees. And if your end goal is to determine the value of a marginal win, dropping the Yankees will give you a much better idea of how much that win costs for the other 29 baseball teams. The Yankees quite obviously over pay for this win for the simple reason that they can. They are often left negotiating with themselves for the top talent. And if someone doesn't pan out, they just throw more money at someone else, while still paying the first guy his big contract to not play. Listen to Wally's suggestion to drop the Yankees and see what happens. The Yankees are what is called an "influential outlier" - the trend looks fairly linear to me. The reason that the quadratic drives up the r^2 is b/c of the Yanks. "And if your end goal is to determine the value of a marginal win..."
I would have thought that the goal was to establish the marginal cost of a win. You do know that any time you add another variable to the regression, the r^2 always goes up?